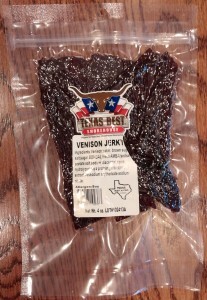 We’re tearing into a bag of Texas Best Smokehouse Venison Jerky picked up at their store in Italy, Texas. Taste (A-): This meat starts out with a slight sweetness followed by a nice peppery tang. The venison flavor is mild and savory and the garlic and other seasonings are perfectly balanced to enhance but not overwhelm it. The pepper builds over time, bringing a bit of heat as you work through the bag, but never too much. It’s a tremendously enjoyable flavor, with the sweet and savory in terrific harmony, and delicious through and through. Texture (A): The meat itself is quite dry. While a little pliable, with only a bit of flexing and you’ll begin to tear off pieces. Since it’s cut along the grain tearing the meat is easy, and while it starts off pretty dry it moistens up quickly in your mouth and delivers a really great chew. The pieces are relatively thin, but still substantial, and you can feel the leanness of this meat it in every morsel. Smell (A): This jerky has a low-key scent, primarily that of the meat itself with a bit of support from the garlic and pepper. The venison smells fantastic, too – solidly meaty – with the seasonings just teasing your nose a bit around the edges. It sets you up nicely for that first bite, foretelling the taste to come. Appearance (A): With natural cut pieces, mostly in substantially sized strips, this jerky looks very appetizing. It has an almost dull sheen, with spots of shininess here and there, and a dark brown color with red highlights peeking through the depths along the with-the-grain cuts. This is a fine-looking jerky. Consistency (B+): This is an expert-made jerky by people who clearly love what they do. The pieces, while natural cut, were uniformly thick. The meat was consistently dry and slightly pliable through and through, too. In only one way, this particular bag was a touch less consistent than we’ve seen from other Texas Best Smokehouse wares – the flavor. While every piece was delicious, some of the pieces seems to lack some of the sweetness of the rest. It didn’t seem to be the normal variation of the meat itself but rather a subtle difference in the intensity of the flavorings. To be clear, it was ALL really, really good, and didn’t detract from the enjoyment of the meat at all, but the difference was a noticeable one none the less. Even with that, the Texas Best Smokehouse folks make some awesome jerky and this venison is another great example of their skill. Overall Impression (A-): One word: Delicious! This is an incredibly great jerky. The venison flavor is frame perfectly by the seasonings of the jerky and the pieces themselves are a joy to eat. They look as good as they taste and you’ll enjoy the bag from beginning to end. This jerky is a definite winner. Grab a bag and we’re sure you’ll agree this is some seriously tasty jerky. Eat well! Tagged Italy, pepper, sweet, Texan, texas, Texas Best Smokehouse, venison. Bookmark the permalink. Act fast - here's an early access sale for some interesting Jerky! Stock up on Jack Link's jerky at 13Deals.com! 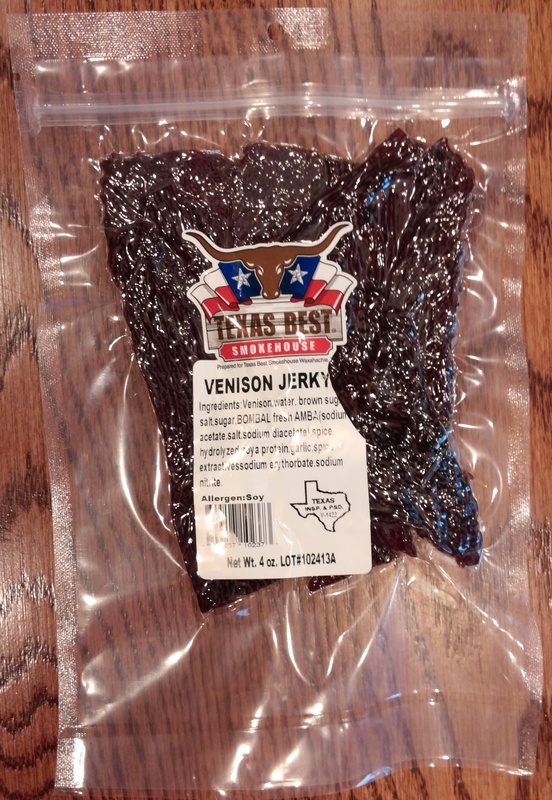 - Coupon Code "SECRETJACK"
Sally Walker: Check out the jerky selection at The New Braunfels Smokehouse. Tasty!